The pursuit of the perfect beach body (or at least looking halfway-decent without a shirt) drives most gym habits. But every time you step on the treadmill or hit the weights, the benefits extend far beyond a buff bod. "Exercise is way more mental than physical," says Dr. Christina Hibbert, author of 8 Keys to Mental Health Through Exercise. "When we exercise, it works like a medicine to improve mental and emotional well-being." 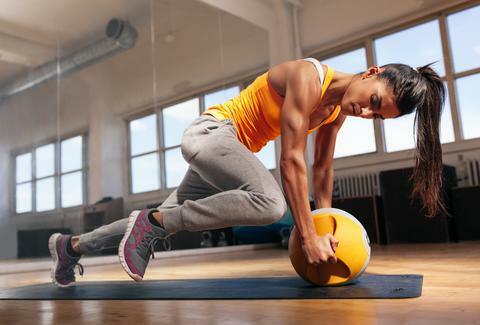 In case those washboard abs just aren’t motivation enough to stay faithful to your gym routine, here are some other serious advantages of your next sweat session. Is there anything more energy-depleting than feeling stressed out or down about life? Aerobic exercise can help you better regulate your mood and respond to stressors. Dr. Hibbert says the key is to find the right exercise to tackle different types of stress. "If we’re feeling really anxious, lifting weights is the best thing to do. It removes tension from the body," she says. "For mental stress, do yoga. It brings clarity of mind. For a bad mood, the best thing to do is cardio. It releases endorphins, gets the heart pumping, and boosts your spirits." If nothing else, focusing your attention on your body should be a welcome relief from financial, romantic, or work-related woes. If you’ve ever felt guilty for sneaking out of work to take a jog, put your mind at ease -- exercise has actually been linked to success for both workers and their companies. "There’s a lot of research that shows we’re more productive at work when we exercise," says Dr. Hibbert. "We face tasks with a fresh mind, instead of feeling burdened and overwhelmed. Companies that take exercise breaks together or promote exercise in the workplace find that employees are much more productive, find greater success, and have more satisfaction with their jobs." Contrary to what your boss might believe, leaving your desk for an hour to pump some iron actually leads to more output from workers. One study found that workers who exercised for 30-60 minutes during the workday experienced a 15% uptick in productivity. Habitual insomniacs are all too familiar with the frustration of tossing and turning all night long. But rather than using pills to hit the pillow, Dr. Sujay Kansagra, sleep health consultant for Mattress Firm and director of Duke University’s Pediatric Neurology Sleep Medicine Program, prescribes a healthy regimen of physical activity. "Regular daytime exercise is shown to improve sleep quality and allow for more consistent sleep. This leads to less complaints of daytime sleepiness among those that exercise and may help insomniacs sleep better over the long term," he says. "But keep in mind that the elevation in body temperature immediately after exercise may make it harder to fall asleep. Therefore, if you exercise late in the evening and find it hard to get to bed, try moving your exercise routine to earlier in the day." The endorphins released by moving your body lighten even the darkest states of mind. "Bad moods usually happen when you don’t have enough energy to meet the tasks at hand. Cardio tends to clear the mind and energize you," says Dr. Hibbert. She also attests to the ability of movement to improve motivation and self-esteem. "Most people focus on the physical ways that [exercise increases confidence] -- looking and feeling better, which are certainly true," she says. "Knowing you’re doing something good for yourself makes you feel better, as well. In a way, you’re taking charge of your own destiny. It’s a reminder to yourself that you’re responsible for your body and mind." And when you take that responsibility seriously, treating your body and mind with care, you’ll have a well-deserved spring in your (pedometer-counted) step. Joni Sweet is a writer and fitness fanatic who counts guilt-free scoops of ice cream as another surprising benefit of exercise. Follow her on Twitter and Instagram at @JoniSweet.